Finally there is an honest attempt to deal with a subject which not many people here in Assam wish to talk about. Through the film ‘Ekhon Nedekha Nodir Xipare’, which released last week, debutant director Bidyut Kotoky has taken viewers to Majuli, the troubled island in the river Brahmaputra. Over a course of 90 minutes, the director has convincingly portrayed the trauma of the people of Majuli, which once enjoyed the status of being the world’s largest river island. From flood erosion to insurgency, the inhabitants of Majuli have suffered a lot. Inspired by the ‘unfortunate’ incident of kidnap and murder of social activist Sanjay Ghose in 1997, a brave step has been taken to raise the issue once again by Kotoky. 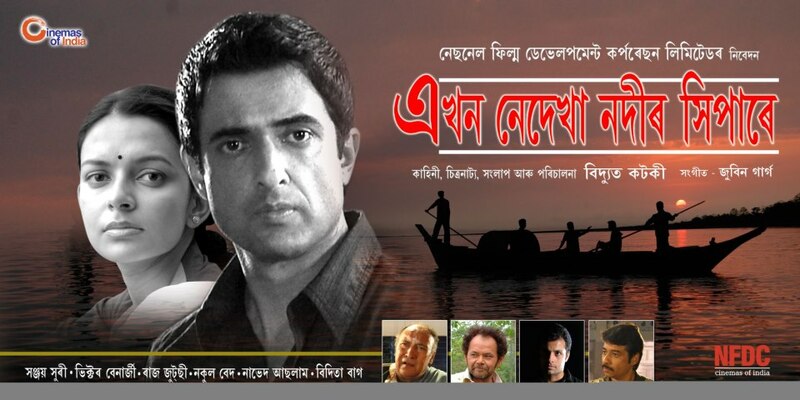 It was a difficult task to make a host of Bollywood actors deliver dialogues in Assamese, but Kotoky managed to do it in a commendable manner. Sanjay Suri depicted the character of Abhijit, a journalist who comes from Mumbai in search of Sridhar Ranjan who has been missing in the island. Despite Suri being in the lead role, it’s Raj Zutshi who stole the limelight with his brilliant work. Zutshi played the role of Jayanta Doley, a surrendered militant turned peace activist. Veteran actor Victor Banerjee as a strife-ridden grandfather was better than average. However, Abhijit’s guide Sudakshina, played by young Bidita Bag, needed a bit more effort to smoothen her Assamese accent. Otherwise, she looked natural as a village girl. Her brother Jyotiraj who is a part of the insurgent group, played by Nakul Vaid, and Naved Aslam, who played the character of Sub-Divisional Police Officer (SDPO) Sameer Agarwal, were able to do justice to the characters. Another big name associated with the film is four-time National Award-winning cinematographer Madhu Ambat, while sound recording was taken care of by Nakul Kamte, who has two National Awards under his belt. Rajesh Parmar, winner of two National Awards, was in charge of editing.